If you simple want to return your boots please use our RETURN REQUEST FORM. Thank you. WHEN YOU REORDER A NEW SIZE OR STYLE. Our goal is your complete satisfaction with our products and service. a Exchange Authorization (RA) number for the return. Please complete and submit the form below. By submitting a request for a product exchange, you indicate that you have read, understand and AGREE to our Order Exchange Terms and Policies as indicated and expressed below on this form page. TheBootPros LLC reserves the right to inspect the condition all footwear returned for an exchange based on our Order Exchange Terms and Policies as indicated and expressed below on this form page. 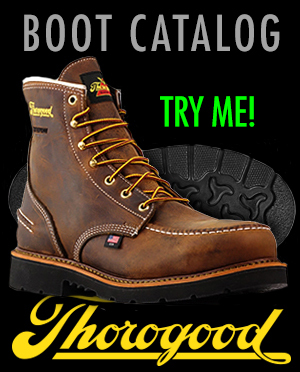 TheBootPros LLC reserves the right to accept and/or refuse any footwear returned for an exchange based on our Order Exchange Terms and Policies as indicated and expressed below on this form page. Footwear item (work boots) must NOT show any evidence of wear or damage; scuffing on the leather upper or bottom of outsole due to use on or around abrasive materials and/or surfaces. Please inspect your boots carefully - your returned footwear product must appear new - scratches, cuts, dents to the leather upper, including dirt, dust, asphalt on any part of the footwear product is considered "wear or damage" by our definition. Our maximum purchase credit offer for footwear products displaying "wear or damage" is 85% of the original footwear product cost to the customer. Footwear product returned with "wear or damage" cannot be returned to the factory as new product, and therefore, is resold as pre-worn or used merchandise. 1) Call us toll-free at 1-800-723-5384 (during normal business hours) and we will process your exchange AND replacement order over the phone...at your convenience. 2) Upon receipt of your exchange request we will contact you by phone to process your replacement order. For your protection, we do not retain credit card information from any previous order, therefore, payment details are required to complete the replacement order. A PREPAID UPS RETURN SHIPPING label will be sent via email upon completion of a replacement order in your name. Returns require an RA number. Upon receipt of an exchange request, an RA number will be sent via email. Please read the instructions and additional details in our email response to this request. When we receive your original boot order package we will make every attempt to refund your credit card account within one business week. Please keep in mind, the refund may or may not show up in your account until your bank activates the electronic transfer. DO NOT RETURN BOOTS directly to the Weinbrenner Shoe Company unless specifically arranged and/or requested by representatives of TheBootPros LLC. Customers will be reimbursed for the purchase price of the boots minus a $3 restocking fee and the original $5 handling fee for each pair returned. Also, any customer-requested express shipping costs (if applicable) are non-refundable. For customers making "Perfect Fit Option" returns, the original service charge for the Perfect Fit option and the original $5 handling fee are non-refundable. Also, any customer-requested express shipping costs (if applicable) are non-refundable. Custom-made footwear sold as a "Special Make" item is non-returnable, non-refundable. Footwear sold as a "SuperSaver" item is non-returnable, non-refundable. any tracking numbers provided by the shipper for reference purposes. Purchase credits or refunds may take 1-2 billing cycles to appear on your statement. to any customer's identity being compromised or account information being misused. Therefore, if we help you with your exchange (replacement boot order), we will ask you for your credit card information.